Through the passion and drive of people like Tommy Purcell and his team, Australian Rules football is continuing to make headway in growing across a growing number of African nations. 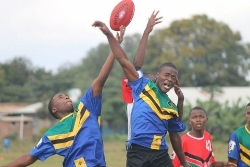 Back in 2014 matches were being played between teams from both Kenya and Tanzania. That competition has now grown to include Uganda in a three-nation rivalry. 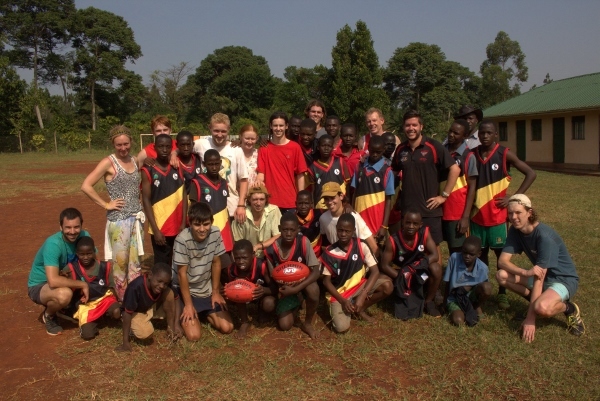 In July the next instalment of the tournaments will take place when the Kenya Buffaloes, Tanzania Simbas and Uganda Simbis meet at the Brother Beausang Catholic Education Centre in Embulbul, 20 kilometres to the east of the Kenyan capital, Nairobi. Our first stories that featured the developments of the game in East Africa told of the first match in Tanzania including Tanzania Newest Kid On The Football Block and Buffalo soldiers: Kenyans beat Tanzanians in historic match. They featured the beginnings of competitive games between Kenya and Tanzania, looking at the historic connections to the game, the potential player pools ad t people who were making the historic games happen. Clearly, since that time, the football, and the people driving it, are taking no backward steps. Tommy Purcell is one of a sizeable number of people who have given their time, expertise and patience - as well as their passion for the game – to bring the game to schools and communities in all three nations. It hasn’t just been a case of football winning out – it has also been a story of providing opportunity for students and other interested parties to be a part of something special. In coming weeks, World Footy News will feature an interview with Tommy Purcell, looking more deeply at the genesis of the game in East Africa – initially Kenya – and how the game has now spread to include two more nations. Whilst the AFL Footwild competition in South Africa is larger and boasts more teams, it is still essentially a single nation competition. What is being achieved across Kenya, Tanzania and Uganda has the potential to grow beyond its current boundaries and become even more inclusive in terms of nations, teams and players. It is already a remarkable story, and it is still in its infancy. More great news from out of Africa, Wes. Any news of internal matches being played and what sort of numbers are "kicking" the Sherrin/Burley around over there at the moment? I have noted that a return match between Simbas and Buffaloes was played in July 2016, but had not heard of anything happening since, so this indeed is good news. Actually that return match was played in 2015, not 2016, so to have some news of more activity in the region is really excellent news. There is more positive news to come in a follow up article. I have been speaking to Tommy Purcell and can say that future growth will include two more countries in the very near future. There is also the strong likelihood of a second Kenyan team (at least) that isn't in Nairobi, fostering ongoing matches within Kenya. All teams mentioned are essentially extensions of the ministry and education work being done in Kenya and other nations so growth at the moment will be linked heavily to those connections (school/church) more so than club development. But, I see that as a wonderful opportunity to grow the game from two nations to three to five and beyond. I hope to have the follow up article out soon with these details.